The Toronto Raptors began their playoff season with an afternoon matchup against the Orlando Magic at Scotiabank Arena. Jurassic Park was bumping, the players were locked in and the in-arena crowd was ready to explode. Toronto was trying to overcome their ugly history of losing game 1’s while the Magic were ready to blow up all projections and steal one North of the border. Simply put, the Magic played suffocating defense. Their frontcourt formed a wall so formidable that it would make the Night King blush. Pascal Siakam was eventually able to crack their defense and erupt for a huge second half while the rest of the Raptors, especially Kyle Lowry, struggled to get their offense going. The Raptors did themselves no favours as they shot themselves in the foot repeatedly with missed three pointers, sloppy turnovers, lazy passes and disappointing shooting from the line. Further credit to the Magic for forcing the Raptors into a lot of isolation play. 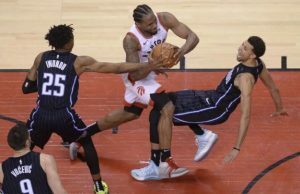 Fred VanVleet and Kawhi Leonard were caught over dribbling and falling into Orlando’s defensive traps. In a dramatic turn, Orlando guard Michael Carter Williams took a hard knock to his face breaking his nose. He left to the locker room in anger followed by a team of doctors and a trail of blood. With only a few minutes left, Kawhi took over with big rebounds, lock down defense and clutch shooting. The game came down to the wire where DJ Augustin (who must have read my playoff preview where I questioned his range) hit a massive three pointer to shock the Raptors. Kawhi completed the nightmare as he came up empty in his last second attempt to tie the game. This was an utterly disappointing loss that unfortunately sounds like the same old playoff story for the Toronto Raptors. Kawhi Leonard looked sharp out the gate. He had a nice bounce in his step and took advantage of some heavy Gasol screens to get space and good elevation on his shot. Kawhi paced the Raptors with quiet excellence. Leonard was efficient from the elbow feeding the Magic a healthy dose of midrange jumpers all game. 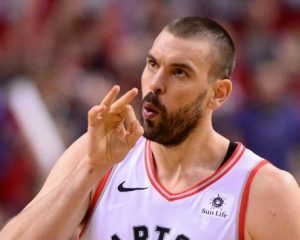 He led the Raptors in scoring with 25 points but looked frustrated at the refs after some empty drives; it is alarming that he only had 3 trips to the line. He pulled down 6 rebounds, handed out 3 assists but also had 4 turnovers. Leonard had a couple of chances to seal the victory but on one occasion he differed to Gasol for a corner three that bricked and, in the Raptors last attempt to tie, he missed everything. Kawhi was excellent tonight but came up short at the worst time possible. Evan Fournier was close to earning this credit, but I am going to give the nod to Aaron Gordon for an impressive defensive night. He scored 10 points, gobbled up 10 rebounds, dished out 3 assists and came away with 3 steals. What stood out to me was his tough physical play against Leonard. Although Kawhi still went off, Gordon played the versatile forward as good as I have seen. He imposed his smothering defense and used his length and frame to keep Kawhi away from the rim. Gordon is strong enough to stop Leonard from muscling him around the paint and athletic enough to recover when he gets beat off the dribble. Aaron Gordon didn’t fill up the stat sheet, but he was pivotal to this Magic victory. Pascal Siakam exploded in the third quarter to propel the Raptors back into the game after a lacklustre first half. He was relentless in his attack with a collection of nifty drives and put backs. Spicy P was pounding his chest to the raucous noise of the crowd after a leak out hammer dunk. He also showed off his defense by extending his go-go gadget arms on a couple of occasions for emphatic blocks. Pascal finished with 24 points, 9 rebounds, 4 assists, 2 blocks and a steal. Siakam was a machine tonight and powered the Raptors with contagious energy. Marc Gasol played heavy minutes for Coach Nurse to match the girth of Nikola Vucevic. He was wrestling against the imposing Orlando centre all night and did his best to seal off his man, collect rebounds and move the ball. Marc had a good game but is no doubt disappointed in the loss. Gasol scored 13 points to go with 6 rebounds and 4 assists. The Raptors brought Gasol in for his playoff experience, but he missed an important shot when the game was on the line. Gasol gritted his way through a tough night. I mentioned in my playoff preview about DJ Augustin’s inability to win. I should have mentioned that it was not because of a lack of trying. The scrappy point guard made Lowry work and forced the latter into an embarrassingly bad night. On the offensive end DJ was crafty as ever, he carved up the lane keeping Lowry two steps behind him on every drive. He also stuck the jumper to help keep the Raptors at bay in the first half. DJ finished with 25 points off an impressive 9/13 shooting to go with 2 rebounds, 6 assists and a steal. The Raptors were able to shut him down for most of the second half, but with seconds on the clock, they surprisingly sagged off him giving DJ a clean look at the net. Augustin, the most playoff experienced Magic, nailed a deep three to break the hearts of the 20 000 plus in the arena. Homecoming – One of the best things about the playoffs is seeing former Raptors come out of obscurity to contribute on the broadcast. It’s always nice seeing Raptors legend Alvin Williams on the pre game show. 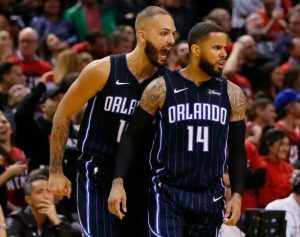 Blue and White Ignite – I am digging the look of the Magic’s play off themed warmups. Classy Man – Former (beloved) Raptor Jonas Valanciunas sat courtside to take in the game. This man will always have a home in Toronto. Jurassic Park – The Raptors faithful flooded the streets of Toronto in support of their squad. There were duelling “Let’s go Raptors!” and “We the North!” chants echoing from outside the Scotiabank Arena. Where’s Kyle? – DJ Augustin dominated the PG battle on the scoreboard 25-0. Kyle shooting blanks all night was cringeworthy. 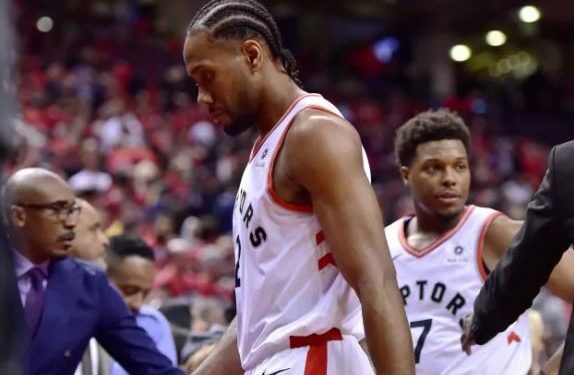 Play the Man – I must agree with Alvin Williams when he said that the Raptors should be playing Kawhi Leonard as much as they can and that 33 minutes are not enough (For reference, Pascal played 42 minutes). I completely agree, these may be our last few games with Leonard and the Raptors should get as much out of him as they can. The Raptors will have to sit with this loss for a few days before a chance at retribution on Tuesday night. Raptors Wrap – We’re Back!